The Knoll Country House Guest AccommodationWhen you want to get away from it all, come to the Knoll. This tranquil country retreat stands in beautiful grounds at the southern tip of Lake Windermere, surrounded by spectacular woodland. Close to the Pier at Lakeside and within easy reach of all that the Southern Lakes has to offer. * 8 individually designed en-suite rooms. * Self-contained luxury apartment (The Retreat). * Free Wi-Fi in guest rooms and public areas. * Gorgeous evening dinners using all locally sourced produce with fully licensed bar/lounge. * Award winning breakfast offering a wide range of menu choices. * Complimentary hospitality tray and toiletries. * Complimentary use of the local 4 star hotel leisure spa. Swan Hotel at Newby Bridge is just 1 mile away for gym, swimming, spa bath, sauna and steam room. Lots of walks from the property. Full wedding license to run weddings for up to 50 people (summer time) and 18 people (Winter). Children welcome from age 14. The Knoll Country House sometimes limits bookings to 3 or more days. Four poster 'boudoir' with king sized bed and en-suite shower and corner bath. The room has a chaise long and comfy chairs along with a beautiful reproduction king sized four poster bed. TV, DVD, iPod dock, Hospitality tray and bathrobes. A perfect room for a romantic escape. Price is based on 2 people sharing and includes a full breakfast. Deluxe 4 Poster sometimes limits bookings to 3 or more days. Comfortable en-suite room with a standard double bed. Flat screen TV with satellite channels. DVD player, iPod dock/clock/radio, complementary toiletries, hospitality tray and bath robes. Single occupancy (SunThurs at discounted rates) otherwise (FriSat) price as stated in tariff. Longer stays may be discounted. Double En-suite sometimes limits bookings to 3 or more days. Deluxe superking bedded room with seating area and bath ensuite. Satellite TV, DVD iPod dock and all usual luxuries. Room price based on two people sharing. Discounts available for midweek low season stays of 2 nights or more. King/Twin sometimes limits bookings to 3 or more days. 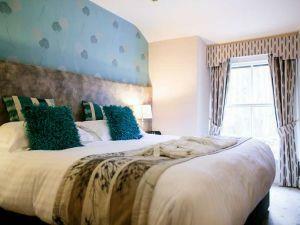 Large king sized bedded room with shower en-suite and lounge area. All usual luxuries as per other rooms in the hotel. From M6 jct 36 follow A590/591 towards Kendal, then take A590 towards Barrow. At the roundabout at Newby Bridge go straight across. Turn right immediately after the roundabout, opposite the Newby Bridge Hotel. Follow signs to Lakeside. The Knoll is located 400 metres on the left past the Lakeside Hotel. Public transport - nearest station is Grange-over-Sands.